William Morrow Paperbacks, 9780060957919, 376pp. From the author of Argo comes an unforgettable behind-the-scenes story of espionage in action. 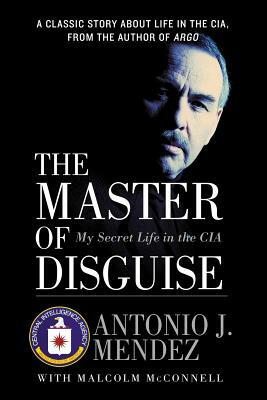 In the first ever memoir by a top-level operative to be authorized by the CIA, Antonio J. Mendez reveals the cunning tricks and insights that helped save hundreds from deadly situations. Adept at creating new identities for anyone, anywhere, Mendez was involved in operations all over the world, from “Wild West” adventures in East Asia to Cold War intrigue in Moscow. In 1980, he orchestrated the escape of six Americans from a hostage situation in revolutionary Tehran, Iran. This extraordinary operation inspired the movie Argo, directed by and starring Ben Affleck. The Master of Disguise gives us a privileged look at what really happens at the highest levels of international espionage: in the field, undercover, and behind closed doors. Tony Mendez is a retired CIA officer who worked undercover for 25 years, participating in some of the most important operations of the Cold War. He earned the CIA's Intelligence Medal of Merit and was chosen as one of 50 officers to be awarded the Trailblazer Medallion. He is an award-winning painter and the author of The Master of Disguise and Spy Dust, which he co-wrote with his wife Jonna Mendez, also a retired intelligence officer. His most recent book is Argo, which tells the story of the operation he ran to rescue six Americans hiding in the Canadian Embassy in Tehran during the hostage crisis. The operation inspired the Warner Brothers feature film of the same name. Mendez currently lives and works in his studios and gallery on his farm in Maryland with his wife.